And no, it’s not a Grecian Urn I’m afraid. If this pot could tell stories I’m willing to bet that they’d be far more wholesome and free of suggestiveness than whatever dirty deeds were afoot on that urn Keats was so taken with. 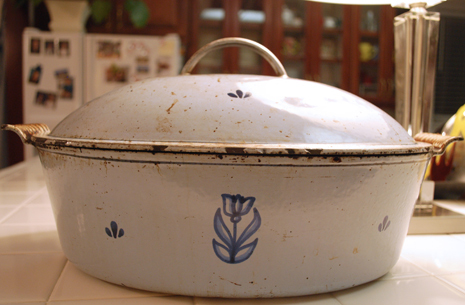 What we have here is an enameled cast iron dutch oven that my grandparents bought in Holland in the fifties. It’s huge. It weighs a ton and three quarters. And for all of my early life, this was the only large pot my mom possessed besides her canner. Pert’ near everything was cooked in this pot. 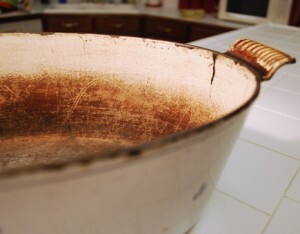 When Mom made spaghetti she would boil up the water in this pot and drop the noodles in . . . sideways. (I don’t think she bought a stock pot until I was in high school!) This was also the one-stop-pot for homemade mac and cheese. Noodles were boiled in it and then drained, the roux was whizzed up in the now-empty pot, everything was reassembled therein and then chucked into the oven. Very versatile pot, this. And due to it’s long years of tireless service, it is now straight black inside. Mom has a gorgeous array of pots these days – Le Creuset in beautiful colors. But this lowly dutch oven still puts in its fair share of stove top time, and I always love seeing it humming away with steam billowing out the sides. I’ve discovered that I could get more of these on ebay . . . some of which are in pristine condition and their interiors are still a spotless white enamel. And if I didn’t mind paying obscene amounts of money for shipping I would totally start collecting them. But I have to say I’d miss that black interior. In my humble opinion the black adds to the charm. my mother has that pot in pristine condition. i keep on trying to heist it but it never makes it home with me. i think she is wary since she used similar tactics to take it off my grandmother in the first place. 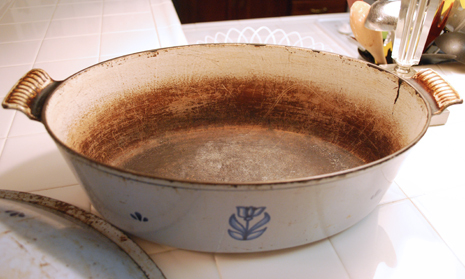 and did you know the same pot was spotted coming out of julia child’s oven in julie and julia? I dunno Bekah…that doesn’t look like you have worn the enamel, with the possible exception of what looks like a crack at the top. Try this…put a goodly amount of baking soda in the pot (say, half a cup) and enough water to go up to the line of demarkation. Let it sit a good, long while…like overnight. Then wash it out with a scrubby sponge, but not too abrasive! I have found this to work on the stubbornest, burnt on whatever in my le creuset and oven and even my cheaper, imitation enameled cast iron. It will NOT damage any enamel…and gets it nice and pretty again. …and still as charming. also try 2 teaspoons of cream of tartar with 1 teaspoon vinegar. i clean my flat top stove with that and it works better than anything i’ve bought. and it was originally for baked on gunk on pots. so hey. Miranda! I saw the pot in Julie Julia as well! And how fun that you have one in the family! As far as the cleaning goes, I may just try those methods and see what happens. But then again, I’ve whaled away on it with Bar Keeper’s Friend and Ajax with absolutely no results whatsoever . . . and from the feel of it I’m almost 100% certain that it’s bare iron in there. However, if it turned out to be cleanable that would be a fun surprise! We’ll give it a shot! Love this post. It makes me want a new white pot. I’m in the market for a cassoulet dish. Family history like that is so wonderful. I’ve got a bit of lace from Allen’s great-aunt that her mother-in-law helped her hemstitch into a tablecloth and place mats when she was getting married. It puts me in mind of the life of women at times. Many days, despite our best scrubbing efforts, our dear husbands come home to kitchen counters covered with the remains of dinner ingredients, a wife with frazzled hair, spit up stains on her shirt, miscellaneous dirty smudges from playing in the yard with the kiddos, band-aids on the fingers from craft-induced injuries, and the odd noodle still stuck in the hair from lunch. Still, these are all signs that she has been working hard and doing her job right! As a dear friend quoted to me, they are badges of honor! I linked to this post a couple days ago simply because it is so sweet. I love tradition like this! It reminds me of my grandma’s house and all the perfect things that are just everyday items. Thanks for sharing.